Three centuries of stock market prices are not the only growth patterns regulated by the Wave Principle. 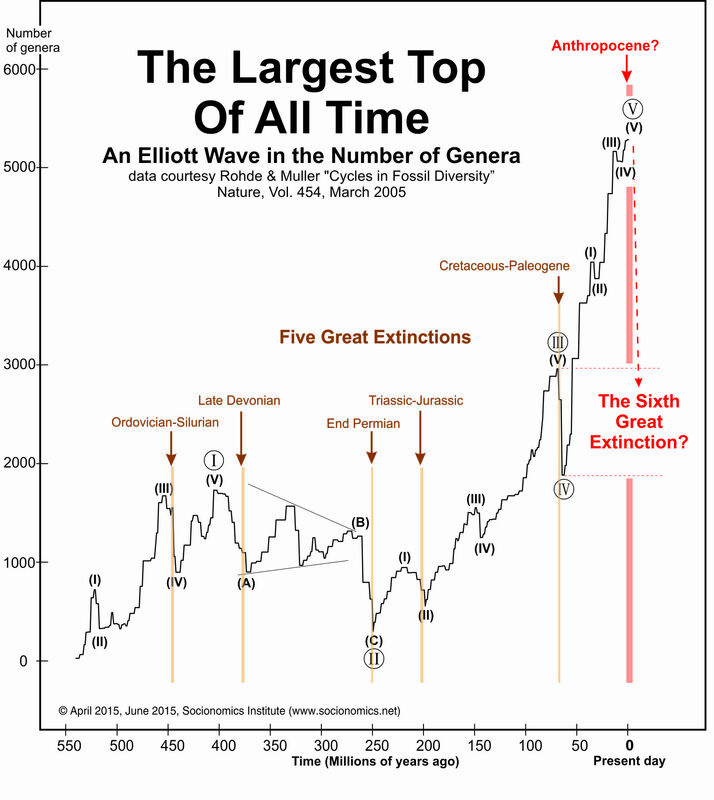 The Elliott wave model suggests that growth in the diversity of life on earth has unfolded in a five-wave pattern spanning 600 million years. Alan Hall’s fascinating article cites recent scientific data to suggest that when the current fifth wave terminates, it may be the largest top of all time. Within families of organisms, there are many genera, and within genera there are many, many more species. Figure 2 plots the estimated number of genera over the past 550 million years from a 2005 paper by University of California-Berkeley researchers Robert A. Rohde and Richard A. Muller. These are the cleanest, most thorough and recent data we could find on life diversity. This graph also forms an Elliott wave. In fact, it looks a lot like a stock chart. Note that waves I (circled), II (circled) and V (circled) all subdivided into five waves as they advanced. Wave II formed a common Elliott corrective pattern. Each five-wave advance preceded the largest decline since the beginning of the advance, another common occurrence. Even the smallest-degree waves show fluctuation. Read the remainder of the concise, three-page article to learn why scientists believe we are on the verge of a sixth great extinction called the “Anthropocene,” and why it is all our fault. New Zika guidelines are out – have you seen them? A Socionomic Study of Eugenics: Will You Make the Cut?